The Ultra, in look and vibe at least, is as close to a Custom Shop piece of art as most of us are likely to get. The attractively breezy edge to the usual range of Les Paul tones. Although most players' perception of a Les Paul is the classic late fifties version, all faded flame, corroded fixtures and gorgeous tone, there has always been a market for the unashamed 'furniture' Paul too. Models such as the Supreme or the seriously over-the-top Ultima offer an almost ludicrously figured maple vibe and will always have their niche. Under the customary pricing restrictions it's not realistic to expect Epiphone to accurately recreate that construction here, but the veneer of quilted maple used on this particular Ultra proves a similar look is at least feasible. Up close, the top moves and shimmers in the light exactly as it should and the faded cherry finish is just the right side of Sunny D orange to add a dollop of authenticity. 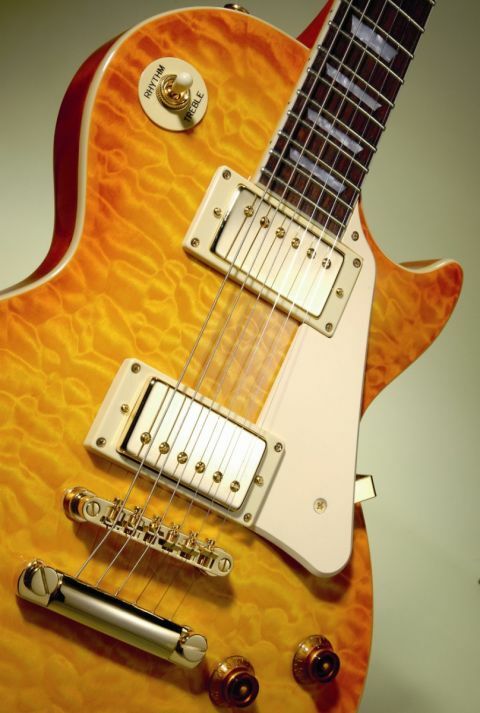 The remainder of the body is made from a spread of mahogany and, in an unusual move, Epiphone has included a deep belly contour into the design. A subtle U-shape, it extends to the central line and adds to the tactile character of the guitar. What's more, the Ultra is chambered, with acoustic pockets either side of the central block and associated strut work, leading the guitar as a whole to weigh in at a mere 6lbs. We should say here that the internal areas of our Ultra were disappointingly untidy but, as they say in the best commercial kitchens, 'what the eye doesn't see the chef gets away with': be advised nonetheless. The touchy-feely assessment is further buoyed by the two-piece mahogany neck: not only is it amongst the skinniest we can ever remember coming from Epiphone - it measures 22mm deep at the first fret - but it has been given a super-smooth matt finish too. Aside from anything else, this combination will efficiently show up any flaws in the fret finishing, and we're glad to report there are no problems in that area here. As a complement to the maple top, all hardware is gold, a feature that will polarise opinion as comprehensively as the merest mention of Yngwie Malmsteen. We don't have too much of a problem with the glittering livery, but others will certainly voice accusations of a level of lily-gilding. The provision of a veneer of maple should, in theory at least, leave the Ultra with an overly mahogany-induced tonal push. However, thanks to the acoustic chambers removing an amount of cubic volume from the body wood, you're actually left with an equally bright and breezy yet rounded tone from the pair of Alnico Plus humbuckers. Music history is littered with quintessential Les Paul moments and we found the Ultra to be best suited to the more overdriven of them: Slash, Hawkins, Kossoff and Page. The treble pickup is perfect for classic rock passages, and flicking to the neck pickup doesn't automatically equate to the unavoidable addition of a flock's worth of wool to your tone. In fact, to our ears, the neck 'bucker was of a slightly reduced power when compared to its sibling, which did add a versatile edge to the guitar. We can imagine that the lightweight nature of the construction should allow many hours' worth of playing without affecting your stature, and the thin neck and flat profile dispense with any need for aggressive string wrestling. The look may not be for everyone, but the tone and playability certainly are. The tone here is best described as offering the best of both of those worlds and it's also different enough from the middle switch selection of a traditional Les Paul, possessing equal amounts of bite and cream without ever being overpowering. In fact, if the tone from any Paul's neck pickup is too much for you (as it can be from time to time), this is a compromise to be seriously considered.